The Irish government has formally launched the country’s bid for a seat on the United Nations Security Council. U2 frontman Bono added his voice to Ireland’s bid to secure a two-year term on the council in 2021. He said “compromise is a word that the Irish people understand very, very well”. The band staged a concert for diplomats on Monday night. Irish PM (Taoiseach) Leo Varadkar said Ireland would bring hard-won insights and practical lessons to the table. He said Ireland understood the need to listen and the importance of respecting differences. 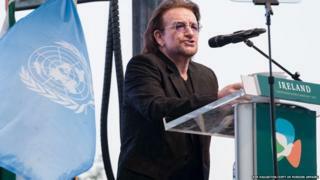 Bono warned that “we live in a time when institutions as vital to human progress as the United Nations are under attack”. He said the UN needed “storytellers” because words mattered and one word mattered in particular. “The word is compromise because that’s how you achieve peace and compromise is a word that the Irish people understand very, very well,” he said. “It is part of our story, our recent story, and we are storytellers. Mr Varadkar said that in the past 60 years, the Irish military, police and civilian personnel had served in dozens of countries around the globe, including Lebanon, Cyprus, the Balkans, East Timor, Liberia and the Congo. “Since the first Irish troops first were deployed on UN peacekeeping operations in 1958, not a single day has passed without Irish participation in UN peace support operations,” he said . “Over the past sixty years, tens of thousands of Irish women and men have worn the blue helmets on UN peacekeeping operations. We are as proud of the blue helmet as we are of the harp or the shamrock. “Every village, town and neighbourhood in our small country has sent men and women to serve on United Nations peacekeeping missions. As a small neutral state on the fringes of Europe that experienced a history of famine, a role in the United Nations has always been historically important to Ireland. The country is proud of the role its armed forces have played in UN peace-keeping and peace-enforcement missions in trouble spots around the world. And there was a great sense of satisfaction that former president Mary Robinson was the UN human rights commissioner. Because of its famine experience Irish diplomats believe they have a keener understanding of third world issues than other developed countries. And they know that Irish missionaries have often played a key role in education and health in such states. Ireland spends about €700m (£620m) every year in overseas aid – that’s close to 0.4% of national income and is rising, but is still short of the UN’s 0.7% target. The country will need all the “soft power” it can get if it is to get the necessary 129 votes of UN members to have a seat at the UN Security Council. Its rivals, Canada and Norway, are also seen as “good guys” in diplomatic circles. As Bono said the worst thing that can be said against Canadians is that they’re “nice” and against Norwegians is that they’re “tall”. Irish diplomats know they have a fight on their hands if they are get a two-year term for the fifth time in six decades. The UN Security Council is composed of 15 members. It has five permanent members: China, France, Russian Federation, the United Kingdom, and the United States, and 10 non-permanent members elected for two-year terms by the UN General Assembly. Ireland won two-year rotating terms on the Security Council in 1962, 1981 and 2001. An exhibition area has been set up outside UN headquarters with tents and stalls showcasing Irish music, food and culture. Mr Varadkar laid a wreath at the building to commemorate Irish peacekeepers who lost their lives on UN service. Is Dwayne Johnson's disabled role in Skyscraper 'offensive'?